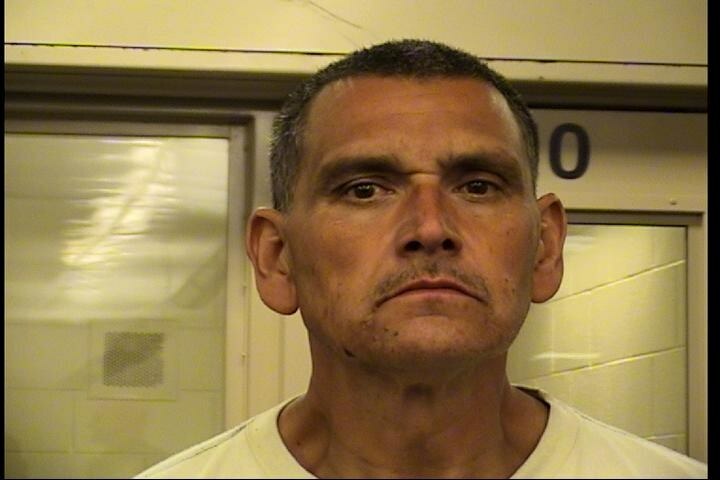 Alex Martinez, 48, was arrested and charged for being in possession of stolen property valuing about $50,000. On March 7th, the Albuquerque Police Department Organized Crime Unit starting conducting an investigation of metal theft that occurred at a local window and glazing company in town. This business reported their 24 foot trailer loaded with 150 pieces of aluminum window frame mullion material was towed out of the yard by a dark colored SUV after an unknown person cut the lock on the fence. These windows are distinct to this company and the owner told police he would be able to identify his property if it was located. Detectives were able to track these aluminum window mullions to a metal recycling yard in town and discovered they were brought in by a male and a female in a green Dodge Ram. On March 22th detectives were told this same vehicle returned to the recycling yard with more of the same aluminum window pieces. They were able to identify the female passenger as Maria Martinez and detectives found her address to be in the 1200 block of Riner CT SW.
On Mach 27th detectives arrived to the residence on Riner CT and heard a chain saw in the back yard and a green Dodge Ram that appeared to be the same vehicle from the recycling yard. Detectives were told by others in the area that they often hear metal clashing together from this yard. Detectives soon after observed a male identified at Alex Martinez leaving the residence in the green Dodge Ram vehicle which was showing to be a stolen vehicle and matched the same plate provided by the recycling yard. A traffic stop of this vehicle was conducted and the driver was identified to be Alex Martinez. He was taken into custody without incident by detectives. A search warrant was served at the residence and detectives located the businesses stolen trailer, other metal mullion pieces and another stolen vehicle. The stolen property was valued at about $50,000 and was returned to their owners. Alex has an arrest history dating back to 1995 and was sentenced to serve jail time in 2010 for Burglary. He was released from NM Department of Corrections in October 2016 then placed on parole. Alex was released from parole in August 2016. Not even 6 months later he is already committing more of the same types of crimes. The Albuquerque Police Department Organized Crime Unit did an outstanding job conducting this investigation quickly and recovering the stolen property for the victims. At this time detectives do not have charges for the female. Alex is being held at MDC without bond.